HR tech tools are important for any business. With the overwhelming array of new technologies, it’s easy for recruiters and business leaders to be confused about what’s most effective for their hiring needs. For Crawford Thomas Recruiting, finding the right HR tech tools and using them correctly was crucial to the company’s success. As a full-service staffing agency, the pressure is constantly on for them to find the best candidates to bring in for in-person interviews. Even though many of Crawford Thomas’s clients were using Skype for interviews, they were still having trouble finding the right candidates. Realizing they needed to kick it up a notch, company leaders switched to using a video interviewing platform. Now, their entire team is confident in which candidates are perfect for moving through to in-person interviews. Much like Crawford Thomas Recruiting, many companies continue using Skype for all their video interviewing needs. Skype is nice for quick chats or meetings, but it isn’t built for the hiring process. It’s equipped with a video feed, but lacks the professional branding and tools that are built into video interviewing platforms. Zack Gallinger, president of Talent Hero Media, witnessed the extreme frustration Skype can create during interviews. “I worked with a recruiting firm that used Skype for all of their video interviews with candidates. Invariably, they would set up a Skype meeting and something would go wrong,” Gallinger said. Technical difficulties aren’t just frustrating for both companies and their candidates, they’re a major turn off, too. #HRtech difficulties ruin the #recruiting fun for everyone. Your job applicants want to feel like you appreciate the time they’re taking to interview with you. Faulty connections are interruptive and come across as unprofessional — even though they’re not technically your fault. 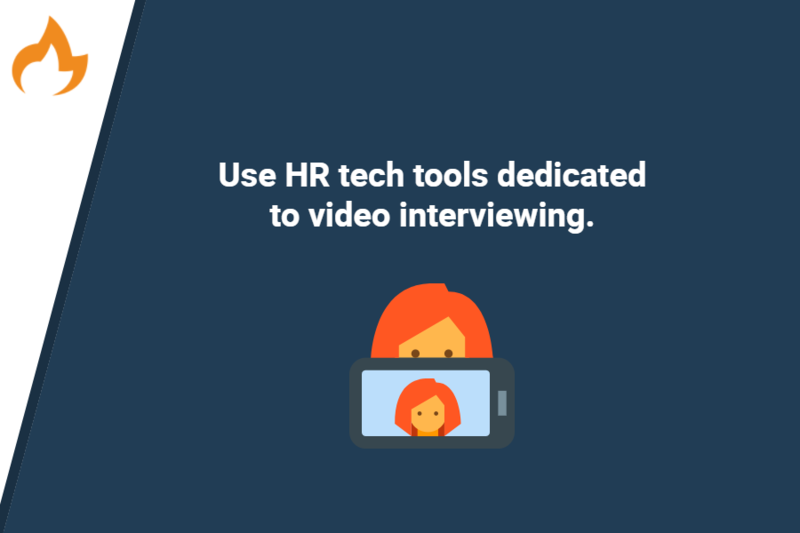 Use HR tech tools dedicated to video interviewing to decrease the number of possible complications. Investing in video interviews shows candidates the company is willing to invest in their employees — both potential and current. Non-mobile HR tech tools are slowing down your hiring process, period. Recruiters are not able to work from anywhere, which slows their reply time to highly qualified candidates. And when candidates don’t receive quick responses, they’re likely to move on to a new opportunity. Non-traditional work isn’t the future anymore; it’s here now. In fact, 64 percent of respondents in Wrike’s 2016 Mobile Productivity Report said staying informed about work topics from any location is the biggest benefit of having mobile devices. Not being able to stay informed and on the pulse of qualified candidates is hurting your team’s chances of interviewing the best people for the job. This is especially true in today’s fast-paced recruiting world. Without a mobile platform, you are losing potential new hires to recruiters who have 24/7 access to them. Give your team the option to get up from their desks and still have access to candidates. Along with more streamlined recruiting benefits, your employees will be able to retrieve candidate information at any time. This means they’ll spend more time reviewing interviews when, where, and how they want to. Scheduling software is an HR tech tool every company uses differently. However, without putting them to work properly, many HR pros are led down an inefficient scheduling path. Companies with scheduling software are at both ends of the spectrum: working too hard and not working well enough. Those who are working too hard use software that doesn’t do enough of the work for them. Using the wrong software creates unavailability issues, double scheduling, and even conflicts with your own calendar. On the other hand, sometimes companies using highly effective scheduling software forget to do their part, too. In order to receive the full benefits, it’s important to customize scheduling tools to match company branding. 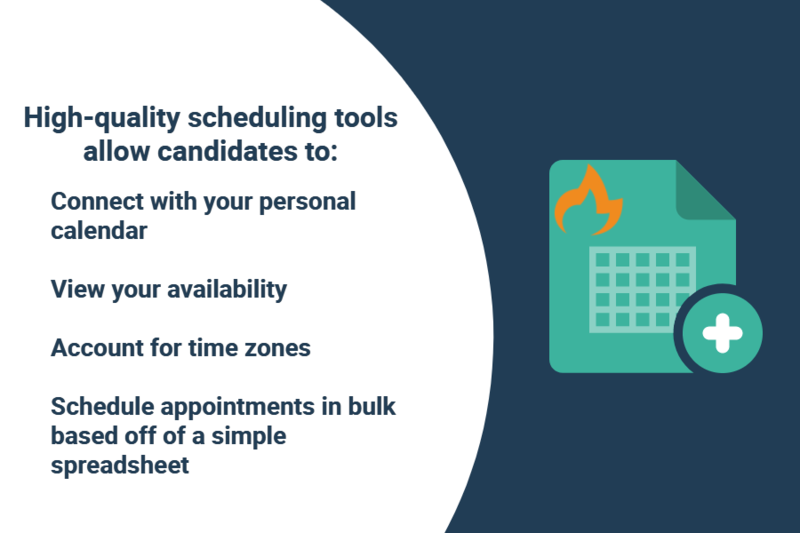 Match #interview scheduling software with company branding for a unified look. Whether doing too much with ineffective software or too little with quality software, you’re not reaping the rewards of scheduling tools. This not only leaves room for major frustrations due to scheduling conflicts, you could also be losing candidates due to a missing branding opportunity. Take a moment to assess your own scheduling technology. Do you feel like you’re putting forth too much effort or like your HR tech is doing all of the work? If you’re doing most of the work, it’s time to start trying out new scheduling software. Sit your team down to discuss what your current tool is missing and what updates would help them work more efficiently. Then, start doing your research to find the best fit. Effective people analytics should take the guesswork out of gauging employee performance and determining future hiring requirements. Unfortunately, many companies don’t know how to use their data. 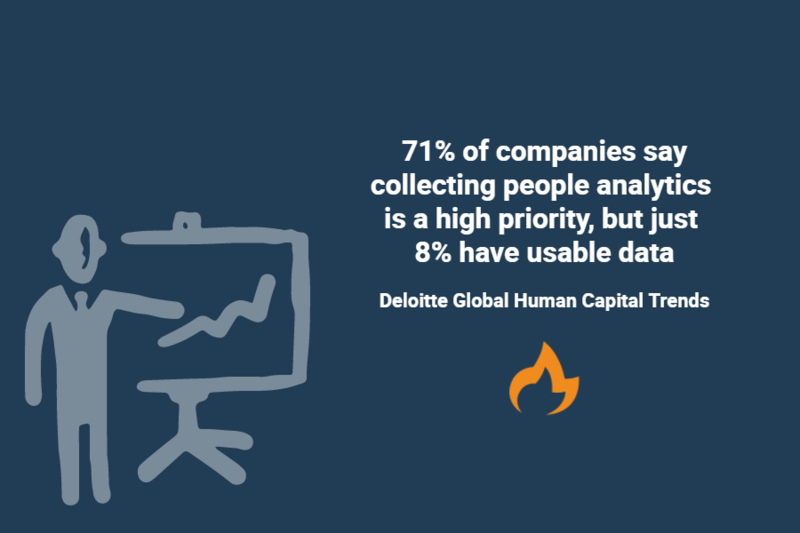 In fact, 71 percent of companies say collecting people analytics is a high priority for their organization, but just 8 percent say they have usable data, according to the 2017 Deloitte Global Human Capital Trends report. With technology advancing faster than we can say “HR tech tools,” employees, company leaders, and job seekers are more stressed than ever. Not recognizing this causes companies to lose touch with employees — even if data is being collected. This means: the act of collecting data isn’t enough. Once employers have data about employee performance or engagement rates, they’re unsure of how to address skills gaps or disengagement. That’s because they forget about the large amount of emotional intelligence and communication skills that needs to accompany the data. Without these key components, leaders are unable to take data and turn it into actionable measures for change. As data flows in, take a moment to analyze it yourself, and then pass it off to your team. Give everyone a moment to consider what it means. Next, ask for their suggestions. What can be done to enhance engagement, hiring processes, and management styles? Many professionals use the cloud to keep all of their documents in one easily accessible place. However, as part of the HR tech tools spectrum, it creates a number of issues for recruiting and HR pros. Using non-HR-specific cloud programs, like DropBox is inhibiting your team from being fully organized and efficient. Relying on outdated systems, like excel spreadsheets, leaves your screening tool notes and collaboration efforts in complete disarray. Pairing that disorganization with the cloud only heightens the confusion. HR tools that lack tracking integration not only slow your team down, but also impact future hiring. Little to no record-keeping limits your chances for finding and contacting a candidate down the line. 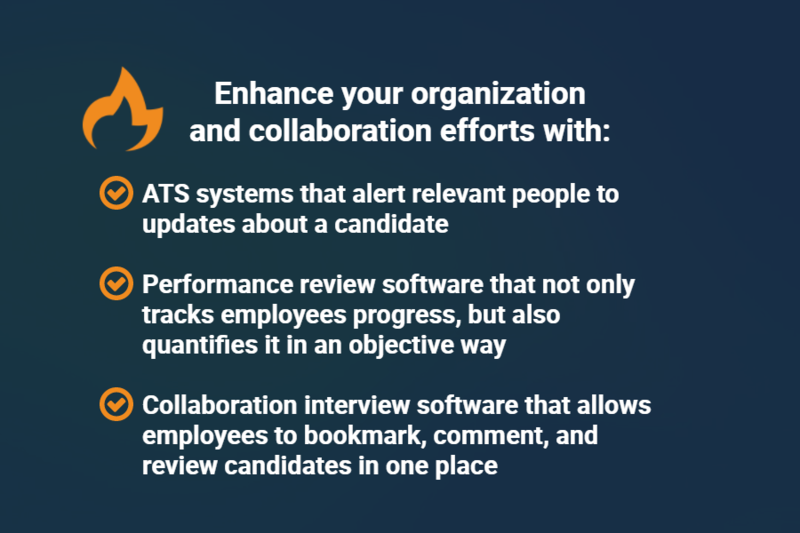 Help your team stay organized, work efficiently, and collaborate with integrated HR tech tools. Those designed specifically for interviewing and record-keeping will add organization and fresh perspectives to your hiring process. Give your team the opportunity to keep track of their own notes and see what their peers are saying about candidates. This helps with finding the perfect candidates for current roles, while also giving co-workers a peek into those who didn’t make the cut this time. Not all HR tech tools will be right for your company, but it’s important to stay up-to-date on changing tech and how it might affect your HR and recruiting efforts. The best way to do this is with quarterly team meetings. Brainstorm ideas about what’s working and what isn’t with employees to keep your HR team fresh, motivated, and productive. 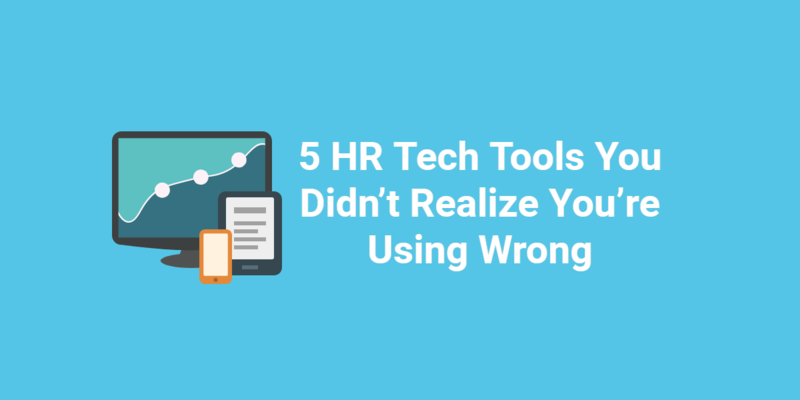 What HR tech tools have you seen used wrong? Let us know!